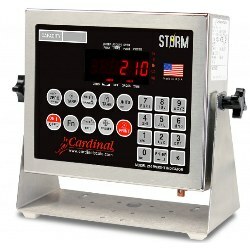 The Cardinal Scale 210 weight indicator is loaded with features, including a stainless steel washdown enclosure, easy-to-read 0.6-in/15-mm high bright-red LED that displays weight to six digits, digital fill control, 25 single IDs, push-button Gross, Tare, Net conversion, flexible print formats, selectable weight units, alphanumeric keypad, tare, checkweighing, time and date, livestock weighing functions. The Cardinal Scale 210 weight indicator is loaded with features, including a stainless steel washdown enclosure, easy-to-read 0.6-in/15-mm high bright-red LED that displays weight to six digits, digital fill control, 25 single IDs, push-button Gross, Tare, Net conversion, flexible print formats, selectable weight units, alphanumeric keypad, tare, checkweighing, time and date, livestock weighing functions, and eight preset weight comparators (PWCs). Four bi-directional RS232 serial ports provide easy connectivity to remote displays, label or ticket printers, or PCs. The 210 available from Central Carolina Scale offers USB-B standard and USB-A optional connectivity. Rugged versatility makes the 210 ideal for weighing applications ranging from bench scales to truck scales. Supports up to 8 350-ohm load cells. NTEP, OIML, Measurement Canada, Australian NSC, ETL, and CE.